Afternoon Map just launched its own Facebook page! Like us to see more maps or follow us on twitter @NicholasDanfort. From The New Assyria newspaper, October 15, 1916. For a full-sized image click here. Despite their obvious idiocy, all sorts of ridiculous maps offering alternative visions of middle eastern borders show up everywhere online, spawning thousands of conspiracy theories and stealing attention from other, more interesting visions (like Lawrence of Arabia's). 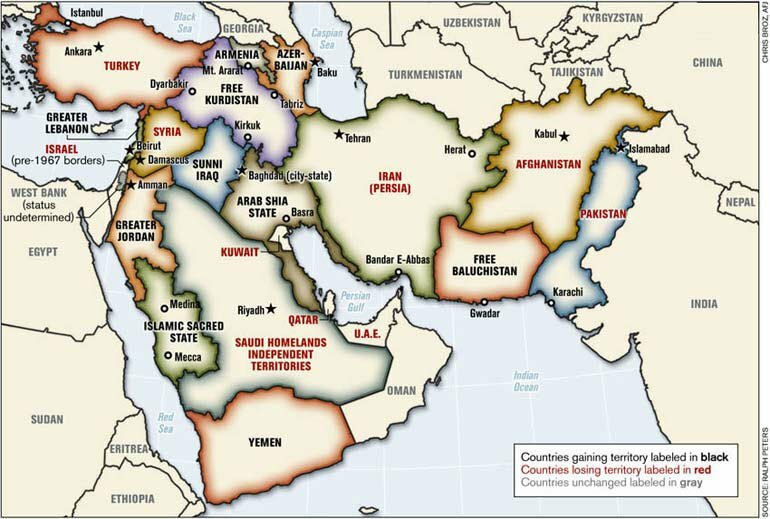 Maps of a reconfigured Middle East remain popular, it seems, because many people are convinced by the - I would argue questionable - idea that poorly drawn imperial boundaries are to blame for the region's problems. So at the risk of starting a whole new set of conspiracy theories, I'm excited to share this map from our go-to Suryani expert Benjamin Trigona-Harany. 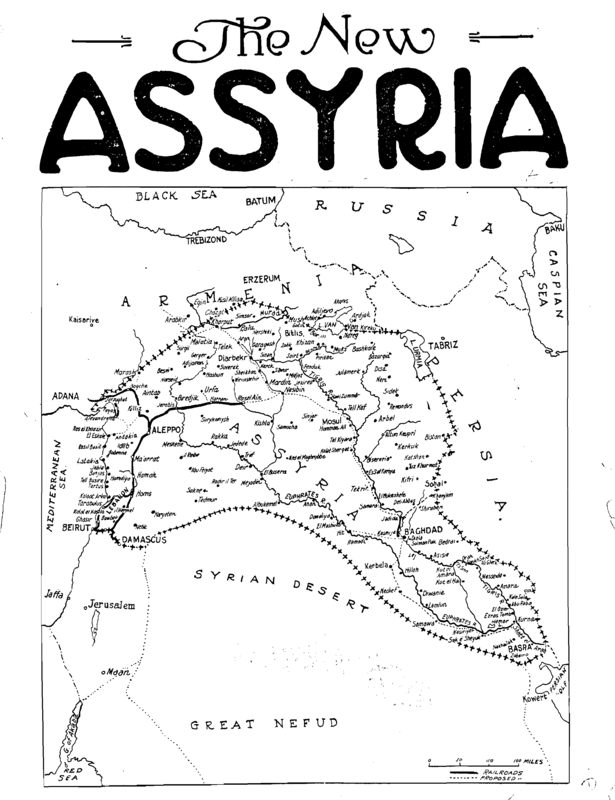 It's another rarely-seen vision for a completely different set of Middle East borders from 1916: The New Assyria. As Ben says "I've always liked this map because it signals that the adoption of a shared ethnic Assyrian identity by the Chaldeans, Nestorians and Süryani was in full swing - not to mention showing their charmingly optimistic borders for a future Assyrian state." "The Chaldeans are Nestorians who joined the Catholic Church. What became the Süryani are one of the groups that rejected the Council of Chalcedon (Kadıköy) for being too conciliatory to the Nestorian position. The others that joined them were the Copts/Ethopians and Armenians. There is also a Catholic offshoot of the Süryani church with its own Patriarch. All of them use Syriac, a dialect of Aramaic, as a liturgical language, and modern variants are still spoken by a few communities today. We can say that today, all Nestorians, most Chaldeans and many Syriacs (meaning Süryani) consider themselves descendants of the ancient Assyrians. A small minority of Chaldeans think they are actual Chaldeans, and perhaps half of all Syriacs self-identify as Aramaeans. Whatever the ethnicity actually is (and I have no dog in that fight), the pre-20th century Syriacs didn't consider themselves to be part of any greater Assyrian community, although a new wave of nationalist historiography centres around proving a continuous Assyrian identity whereas it used to be about proving the ancestral bonds between the modern and ancient Assyrians. The emergence of a greater Assyrian community coincided with the early twentieth-century diasporas, particularly in the United States, and was then reinforced by the arrival of World War I survivors. You don't find an Arab identity like you do in the Maronites (who are also claimed by Assyrian nationalists) or the Levantine Greek Orthodox and Melkites. This map reinforces this maximal claim of an ethnic bond between these different peoples more than it delineates the borders of a future state, and that is what makes this map interesting to me. A few years after the appearance of this map, the Assyrian delegation at the Paris Peace Conference did float the idea for an Assyrian state about half the size of the one you see here; still unrealistic but more representative of Nestorian, Chaldean and Syriac settlement."